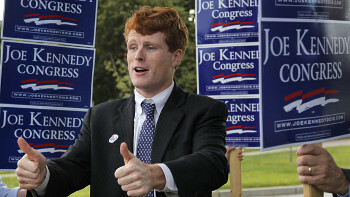 Joe KennedyThe Kennedy dynasty is still sacred to many in the States and right now a young red headed 32 year old grandson of assassinated Robert Kennedy is out on the hustings (stump) trying to secure his first political job. Joe Kennedy 111 is running for Congress in Massachusetts’s Fourth District and is making it clear to everyone that he has a lot more to offer than his family name. However the spirit of his grandfather and his famous brothers means that Kennedy 111 is followed everywhere by a band of elderly Kennedy supporters who aim to revive a dynasty. He graduated from Harvard Law School and worked for only two years as a state prosecutor before deciding to run for congress. His rival, Sean Bielat, a former US marine has said that he is ‘a guy with a famous name and no qualifications’. To other Republican commentators he is seen as a possible return to a hereditary monarchy which they fought so hard to bring down years ago. So on November 6th, will it be an election or what others term a coronation. Kennedy 111 has the financial firepower in this election and his camp believe that he is ahead of his rival although there have been no recent polls to verify this contention.